E Cube CEO, Joe Havey was a guest speaker April 2018 at the Colorado Real Estate Journal conference on Retro-Commissioning. Joe Havey, CEO of E Cube, and team from CABA and HTNG are speaking on the Future of Building Technologies at the Marriott International Director of Engineering Conference May 21-24. E Cube has two new members on the team. Chris Cunningham has been an intern for the last year and joins us after graduation from The Colorado School of Mines. Catherine Dressler joined us after graduating from the University of Colorado with a MS Degree in Architectural Engineering. E Cube is proud to announce three key staff were recently awarded the Certified Commissioning Professional (CCP) designation. This designation is earned through a comprehensive application and examination process and is recognized throughout the commissioning industry as a premier mark of professional achievement. Requirements for the CCP include being active in the building commissioning industry for at least three years, and being of outstanding character, ability and reputation. Building owners can be assured that E Cube CCPs will always meet or exceed any commissioning requirements that may be requested. 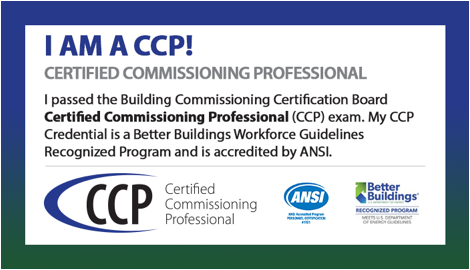 The CCP designation is recognized by the Better Buildings Workforce Guidelines and the Building Commissioning Certification Board (BCCB) announced in June 2016 that its CCP certification is now officially ANSI-accredited. It is the first certification program for commissioning providers to receive the designation.